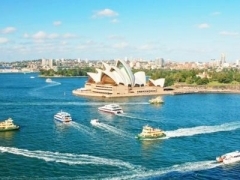 For $698 per pax, you get a 5D3N DeVere Hotel Stay with 2 Way Qantas Airways Flight and Guided Tour (worth $1188). After each day of touring round some of Sydney's fantastic sights, head back to the comfortable DeVere Hotel for some rest and relaxation. Located in Potts Point, the hotel is near Sydney's main business and entertainment district and just a 5 min walk to Kings Cross Train Station. While simply furnished, rooms in DeVere Hotel come with standard amenities for travellers, such as ensuite bathrooms, high-def LCD TV and Wi-Fi. On site, find their Signature Indian Restaurant that serves up spicy dahls, curries and briyanis that will make for a belly-filling meal. Breakfast is served daily, buffet style, at the Macleay Room every morning. Pile plates with freshly baked breads and pastries, healthy fruits and yoghurt and glasses of locally grown and squeezed juices. After touchdown in Sydney, head to DeVere Hotel to relax for the night before your amazing journey in Sydney begins. The tour kicks off with your choice between Port Stephens Dolphin Watcher 286 or Hunter Valley Wineries 299. Discover the pristine sugary white sand of Sydney's coastline and meet some of Australia's famous inhabitants. Observe crocodiles, kangaroos and koalas laze around right on their own turf then ride waves with mischievous dolphins that like getting up close and personal with curious bystanders. Or if choosing Hunter Valley Wineries, take a slow and relaxing tour through some of Australia's best vineyards. The scenic ride through the farms will feature lustrous fields. Tour around Australia's oldest commercial wineries and discover how different grapes, soil and fermentation processes create layered bouquets of reds, whites and non-conventional wines. Then taste some homemade brews along with slices of cheese in a wine tasting session. Learn how to differentiate top notes from undertones and extend vocabularies in describing wines in the informative session. On the next day, head over to Blue Mountain. The World Heritage site is full of native history where Aboriginal Australians first settled. Explore the area that forms part of the Great Dividing Range that separates the city from the vast Outback. View unique Australian wildlife here or upgrade to the Jenolan Caves. Walk through a maze of limestone crevices, stalactites and stalagmites.